Let Lutron turn the lights on and off for you—and avoid wasting energy. 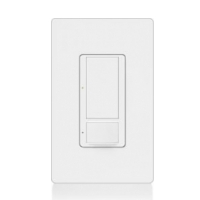 Lutron’s Maestro Switch with Occupancy Sensor offers an excellent combination of energy savings and convenience without sacrificing aesthetics. The occupancy sensor detects when someone enter a room and turns the lights on, and then detects once a room has been vacated, automatically turning the lights off. An adjustable timeout function allows you to set the time before the lights turn off. With a sleek design, the switch with occupancy sensor is a great energy-saving addition to any room in your house, including kids’ rooms, bedrooms, dining rooms, garages, and basements. The switch has a 30’ x 30’ (900 sq. ft.) coverage area and a 180˚ sensor line-of-sight field of view. It may be set to timeout after 1, 5, 15 or 30 minutes. Note: A wallplate is not included, so should be purchased separately.